The Australian Business Award for Service Innovation recognises service products that provide innovative solutions for new and existing market needs. processes and reduce overheads, placing a strong focus on improving operational efficiency and customer service. Fieldmagic has been a result of a close collaboration between CRM Online and West Australian based Westside Fire Services. The focus was on building a solution that would streamline a number of processes across the business, from quoting to job management and scheduling, maintenance, to how it could efficiently remove paper-handling processes and deliver a better, more effective on-the-job experience for technicians. 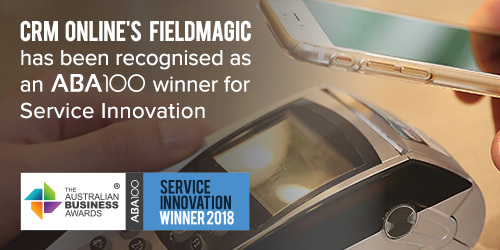 By building the solution on top of a leading CRM, Fieldmagic is able to focus both on providing tools to drive customer management, while having a core platform to drive field services workflows. The results are arguably the most complete Field Services solution on the market today. The platform includes a quoting engine designed specifically for field services, a job scheduling calendar to more effectively manage technician workloads, an easy to use offline mobile application with GPS tracking, time and materials tracking capabilities, electronic signing, and integration with major Australian accounting systems. More importantly, Fieldmagic also includes an industry first ‘configurable checklist builder’ for industries where job cards are required to be completed on the job. The checklist builder allows orgainsations to move away from paper-based job cards and checklists, providing a more secure electronic means of recording job and maintenance outcomes in the field and reporting this to customers with a faster turn around time. Although Fieldmagic was originally developed specifically with the Fire Services Industry in mind, the core platform has also aligned well to support a range of field services industries. In fact, Fieldmagic has found it’s place in a wide range of industries, including: IT & Mobile Support; Mining & Oil and Gas (maintenance of assets); Electrical Contractors; Maintenance; HVAC / Air Conditioning; Security Industries.